Chameleons are a type of reptile that are able to change their colour to match their surroundings and disguise themselves—they are the ultimate ninjas! This fun and interactive paper plate craft lets you create a colour changing chameleon of your own! 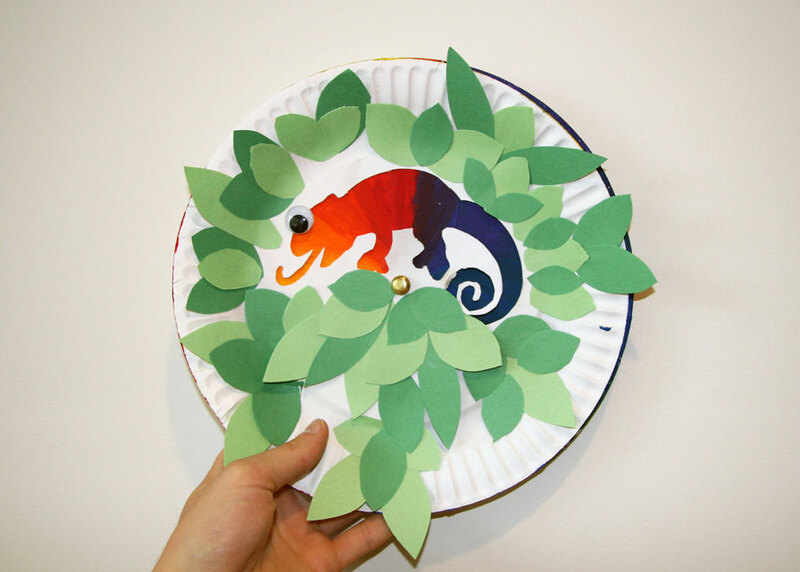 This paper plate chameleon craft is a great accompaniment to the children’s book The Mixed-Up Chameleon by Eric Carle or as an exciting way to practice colour skills. a variety of colourful paints and paintbrushes (use your imagination and your favourite colours). Paint the top of one paper plate a rainbow of different colours. Feel free to be as creative as you want; younger children may want to use their fingers and get really messy while older children may want to make a colour wheel in the ROY G BIV fashion. While the first paper plate is drying, draw a chameleon onto the top of the other paper plate. You can use the template we provided or draw your own. ADULTS ONLY: Using scissors or an exacto-knife, cut the chameleon out of the paper plate. Be very careful as it is a challenging shape to cut. Place the chameleon paper plate on top of the colourful paper plate and secure them together with a brass fastener through the middle. OPTIONAL: Use your creativity to add some finishing touches to the chameleon paper plate—add a googley eye, create construction paper leaves (we provided a template for these as well! ), or paint on a branch for the chameleon to sit on.